Here's a link to the Park Service website for the Timucuan Ecological and Historic Preserve. 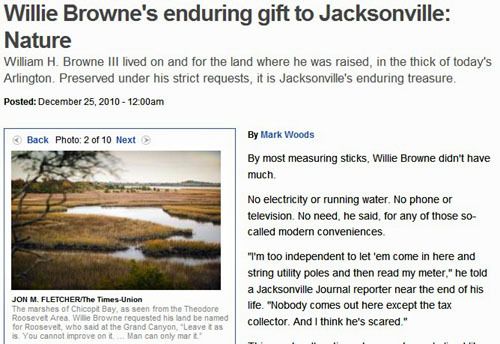 It includes Ft. Caroline, the Kingsley Plantation (the oldest plantation house in Florida) and miles of wonderful trails through the woods and over ancient shell mounds left from the Timucuan Indians. Can the Birds Count on You??? 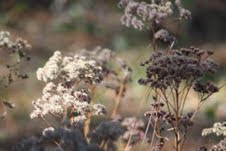 Folks have been counting birds for decades, but can the birds count on you... to provide habitat filled with native plants that provide food, shelter, and places to raise their young? This is the 111th year that Audubon Society has organized its Christmas bird count. This definitive data shows without a doubt that our native bird populations have decreased dramatically over the decades. Most of the declines are due to decreased habitat, but we are not helpless and we can all do much more than wring our hands in dismay. Greg Braun from Audubon of Martin County in south Florida created a slide show which illustrates specific examples of how and why people of south Florida can make a significant difference for their birds. Plants, especially evergreens, have long played a role in celebrating pagan and religious events and holidays. 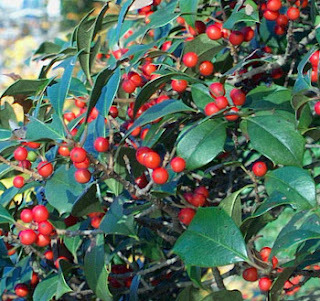 When celebrating the holidays this year think about planting some native hollies in your landscape. Evergreen hollies are good for screening and offer excellent habitat for birds, while deciduous hollies offer outstanding beauty of berries on naked branches. Hollies are dioecious, which means that trees will bear either male or female flowers, but not both. The female trees bear those attractive berries. (Nurseries should label whether a holly is a male or a female. Be sure there is at least one male tree in the neighborhood or your female trees won’t produce berries.) Hollies grow best in acidic soil and once they are established, require little care. The USDA reports that the biggest destroyer of holly trees is not disease or insects, but people harvesting its branches for the Christmas trade! Ann Redmond sent out an end-of-year message to the membership. Read it to see how you can receive a 22-photograph theme for your Windows computer by our own Shirley Denton. 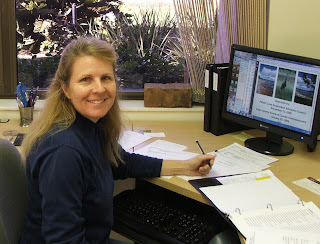 We’re just finishing up our Thirtieth Year as the voice for Florida’s native plants! We’ve really leapt forward – a Resolution from the Governor and Cabinet recognized our contributions this year. Our efforts have spawned development of a confederation of NPS’s in the southeast. Our grant funding has fostered conservation and restoration of Florida’s natural lands. There have been recent scientific publications from research for which we provided grant funding. We are making a difference in many ways throughout Florida. Want to hike and earn money for FNPS? There's an app for that! Green Boot Media is a new organization providing funding and publicity for non-profit environmental groups. They raise revenue from advertisers who pay to be featured on the ad stream that runs while you are walking. FNPS is officially signed up, and we got our first exposure from Green Boot when they welcomed us on their Facebook page, with a link to us, which went out to all the other Green Boot members nationwide. In Florida, The North Florida Land Trust, Tampa Bay Watch, Apalachacola Riverkeepers, the Conservation Trust for Florida, and the DuMond Conservancy are also using Green Boot. You have to have an iPhone to use it so far, but we are hoping it will morph over soon. So if you do have an iPhone, go to the iTunes store where you can download the Green Boot app for free. If you have friends who have iPhones, ask them to do it, too; you do not have to been an FNPS member to get steps credited to us. Native plants make nifty wreaths! The FNPS's Conradina Chapter was creativity in action Monday night as the members, along with their friends from local garden and herb clubs, joined in a convivial group to fashion wreaths and other seasonal decorations using native plants. As you will soon see, a wide variety of methods and styles, both conventional and un, were successfully employed. Simpsons stopper, sea grape, magnolia - leaves and pods, satin leaf, yaupon holly, yellowtop, southern red cedar, coontie, spanish moss, salt bush, palm fronds, several grasses, dried ferns and polypody, pine cones, and some native-found treasures like feathers and shells. Kariena Veaudry, our own FNPS Executive Director, spearheaded the effort to save 17,000 acres of pristine Florida habitat in Osceola County, winning her an award from the Sierra Club. Here's the story of how one woman used passion, determination, and political savvy to battle bad decisions by government and corporate interests. Kariena shares her top three tips you can use to influence Florida's public input process. 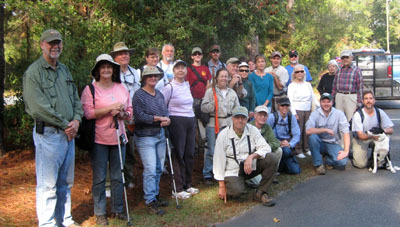 This is the second part of a summary of an FNPS field trip with Florida plant guru Gil Nelson. Click here to read Part 1. 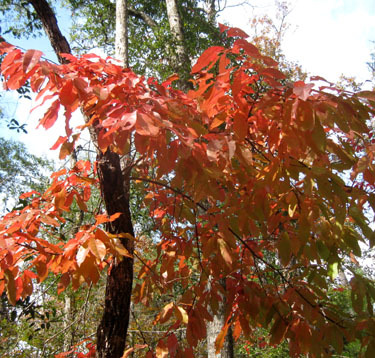 Gil thinks that sourwood (Oxydendrum arboreum) should be more widely planted. Particularly because of its year round interest including its unusual salmon-y fall color. It's a panhandle plant, but might also do well farther east. We saw quite a bit of leatherwood (Dirca palustris) which makes quite a show this time of year with its yellow leaves. Gil explains that its common name leatherwood refers to the pliable stems, and that Native Americans used these twigs instead of leather to make ropes or thongs. It's only found in a few Florida panhandle counties. We found some partridgeberry (Mitchella repens) groundcover, but very few patches still had their bright red berries. This occurs throughout north and central Florida.